Lynn Lobel, Grants & Resource director for Queens Council on the Arts, explained the components of grant writing. She was joined by Molaundo Jones, Arts Services Manager with Queens Council on the Arts. State Senator James Sanders Jr. (D-Rochdale Village, Far Rockaway) held a successful Community Development Day event on Wednesday, June 28, 2017 at the Richi Rich Palace in Richmond Hill with more than 100 people in attendance. The full day of free workshops featured information on grant writing, fundraising, growing a non-profit, small business or house of worship and much more. Senator Sanders is a strong proponent of community building through economic development particularly advocating for more opportunities for people of color. Although he could not attend the event in person, since state legislators had been called back to Albany by the Governor for a special session, he conveyed greetings to the attendees via video conferencing. In the grant writing portion, Lynn Lobell, the Grants and Resource Director, for Queens Council on the Arts, covered grant budget basics including how to fill out an application, writing a letter of intent, writing a letter of proposal, creating a budget and providing documentation and support materials. Lobel explained that those applying for grants should include a detailed project description outlining the who, what, where and why of the proposal. The budget components should contain information about the organization’s expenses (operating costs, money for personnel) income and in-kind contributions. QCA's Development Coordinator Masud Grant recently served on a judging panel in Congressman Joe Crowley’s NY14 Congressional Art Competition. Students from across New York's 14th District had the opportunity to submit art works. The winner's work will be on on display in the nation's Capitol for a year, and gets a free flight down to DC to attend an opening reception. Good luck to the entrants! We look forward to introducing the winner next month! February's "Creative Conversations" meeting at the SUNY Queens Educational Opportunity Center in Jamaica, Queens, was joined by Kendal Henry, Director of Percent for Art at the Department of Cultural Affairs. 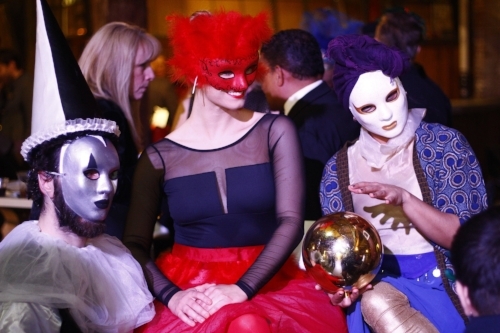 On February 16, Queens Council on the Arts celebrated the borough’s artistry at the Knockdown Center during a gala inspired by the Venetian carnival tradition. We honored renowned honorees, sculptor Joel Shapiro and photographer Tony Vaccaro. Our guests experienced lively entertainment including casino games, music, dancers and sketch artists. Proceeds will benefit QCA’s Emerging Artist Fund, to support artists and cultural leaders in Queens. For more images from the event, visit our Flickr page.